Can “machine people” 机器人 save China’s restaurant industry from severe labor shortages and high turnover? Another Lunar New Year has come and gone (Year of the Dog). This month, as China rings in the Year of the Pig (2019), every restaurant and noodle shop will be overflowing with festive patrons…and a lingering worry: The worry: How will China meet the challenge of severe labor shortages and high turnover in its restaurant and food industries? With more than a billion mouths to feed, that’s more than a bit important. Nowhere is it more apparent than in the low-paying, long-hours restaurant industry, where no mother’s son or daughter is ever encouraged to make a career in a kitchen or waiting tables. What to do? Well…what about robots? Online shopping giant Alibaba and others are taking on the challenge with robots. Since 2014, robots in China have been picking up more and more jobs in the country’s restaurant industry; and here in 2019, as worker shortages worsen, a major effort is underway to use robots to mitigate the dire labor scene. 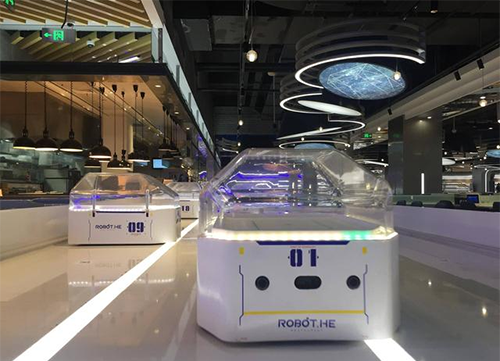 The restaurant chain Robot.He, part of the Alibaba-owned Hema grocery business, intends to revolutionize the consumer restaurant experience through robots and digital technology. Until food is served at a customer’s table, says Alibaba’s Jack Ma, food is all about manufacturing and logistics: A kitchen is in reality a factory. Robot.He, taking a page out of autonomous vehicles for warehouse logistics, now exclusively employs robot servers to bring food to tables. This groundbreaking concept has materialized in over 100 stores across China, three years after the initial launch. Compared to human wait staff, robotic ones work more hours, take no tips, never ask for a raise and never complain—all restaurant-friendly factors that will eventually lower costs for companies and lower prices for consumers. As Business Insider reports: “Though some [robots] have proven pretty incompetent, they’re still cheaper than human wait staff — the approximate $1,200 up-front cost per robot is just a couple months’ salary for an average server in China (though robot prices vary). THE JOB NO ONE WANTS TO DO: Unable to find a human noodle slicer (salary $6,400 per year) inventive Beijing noodle shop bought a robot noodle slicer for $1,600 (one-time cost). The robotic noodle expert is taking China’s noodle bars by storm. Alibaba’s longtime, online retail rival, Jing Dong (JD.com), is also trying to hop on this potentially lucrative robot train with its XCafe restaurant line. Jing Dong opened its first robot XCafe on Nov.10, 2018—two years after the first opening of Robot.He. “As an innovative attempt to integrate smart technology with the catering industry, JD.com is transforming and upgrading traditional industries through artificial intelligence, robotics, big data and other technologies, enabling unmanned technology to have a broader application space,” said Xiao Jun, vice president of Jing Dong Group. Alibaba faces more problems than sharing the market with Jing Dong. Now that the initial hype has worn off, some consumers are now skeptical about robotic restaurants. The main concern is the overall quality of the restaurant-going experience. As consumers who have no knowledge of the intelligent technology behind such robotic restaurants, it is difficult to blindly place trust in the quality of the restaurant’s cuisine , the quality of service, the quality of taste and the quality of cooking itself. 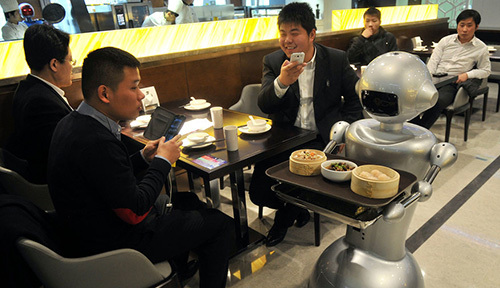 The role of robotics in China’s fast-growing restaurant and food industry is not limited to waitstaff. There are more and more applications for robotics that challenge the traditional notion that robots are fundamentally incapable of performing complex and creative tasks. In the up-and-coming Hunan cuisine robot restaurants, robots have perfected the art of regional Chinese cooking—e.g. World’s First Hunan ‘Robot Chefs’ Debut in Changsha, where 40 Hunan regional dishes have been inputted into the robot’s database. The reviews are in, and the robots are faring pretty well. The owner of this new robotic restaurant is aiming to challenge the global leader in fast food, McDonalds, by trying to become the next biggest global, fast-food chain. 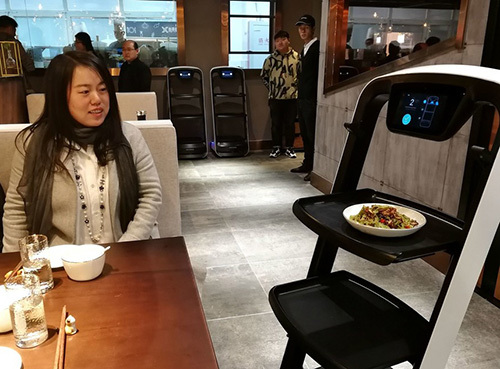 “We want our customers to enjoy not only the dishes, but also the technically standardized robot cooking,” said Li Zhiming, inventor of the robots and owner of the restaurant. It is not clear whether the owner’s visions will come true or not. After all, just like McDonald’s, Hunan cuisine robot restaurant also has a universal recipe that never changes. Is there a future for McHunan? China has a gigantic robot market with unpredictable potential. In order to develop that potential, there needs to be more companies willing to invest—not just conglomerates like Alibaba and Jing Dong. Small and local companies also need to put their faith in intelligent robotics. The industry needs to help its consumers to catch up and be educated on using intelligent technology—to be able to acknowledge, in certain areas, that robots can be just as reliable, if not more so, than human workers. 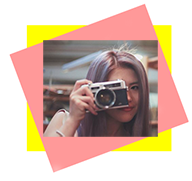 Asian Robotics Review is pleased to welcome a new writer to our ranks: Zijing Fu, writer, editor and photojournalist. Zijing offers our readers an insightful, contemporary look at automation, robotics and society in the new Asia as well as the influence of Asia globally. Born and raised in Tianjin (China), Zijing has worked as a writer, editor, and translator in both Mandarin and English. She is a product of Boston University Journalism, and has written and produced articles and video programming for Tianjin Channel 9 News as well as China Daily. Zijing is also currently serving as chief editor for the online publication Enroute China.